After working closely with several customers to better their text marketing campaigns, we’ve come to find there is a basic formula for sending the perfect text. Lets take a look! Make your customers feel special. Do not make it seem like anybody can get this text deal. If you are not on the list you cant get the deal. One customer may be a member to many campaigns across town. It is important to make sure the campaign is specific to your business. This is how you hook the customer. Start with the deal and make sure it’s obvious. 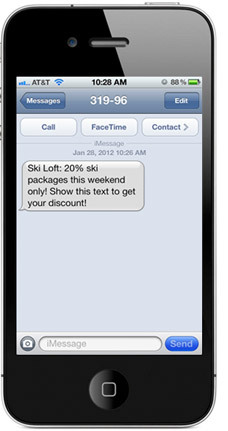 With text marketing, you’re limited to the amount of characters in you text so make it short, sweet, and to the point! Example: Show this text at Bob’s Burgers and get HALF OFF your appetizers with purchase of an entrée. It’s important to include an expiration date with your campaigns when offering a special. This sparks more of an immediate reaction for the customer to visit your business now or respond to the call to action sooner. The sense of urgency also adds to that feeling of exclusivity! You can learn more, you can check out our easy text message marketing tips by clicking here!